A major East Coast ship overhaul and repair center, constructed at a cost of $46.7 million, was opened recently in Portland, Maine. The facility, jointly owned by the City of Portland and the State of Maine, will be operated by Bath Iron Works Corporation (BIW), which has maintained a shipyard 40 miles to the north in Bath for 100 years. The voters of the City of Portland and the State of Maine each approved $15-million bond issues in November 1981 to convert the old Maine State Pier into the modern ship repair facility. The major installation at the facility is an 81,000-ton-capacity drydock that was awarded to the state by the General Services Administration. Since the approval of the bond issues, BIW crews and private contractors have completely renovated the drydock and existing buildings and piers, and new piers and utility buildings have been constructed. In addition to the large floating drydock, the facility features an average minimum water depth of 37 feet at the 600-foot and 1,000- foot piers, and will have 60- and 25-ton-capacity cranes on the piers. Each drydock wing wall will carry a 25-ton capacity crane. The facility, with 70,000 square feet of outside storage space and 25,000 square feet of inside storage, will perform both Navy and commercial conversion and repair work, with the capability of accommodating all commercial ships except VLCCs, and all Navy vessels except large aircraft carriers. The U.S. Navy has already taken advantage of the facility by awarding BIW a $67.7-million contract to overhaul three Spruance Class destroyers. The first of the three ships, the USS Conolly, will arrive at the Portland facility February 15, 1984, to begin her overhaul. 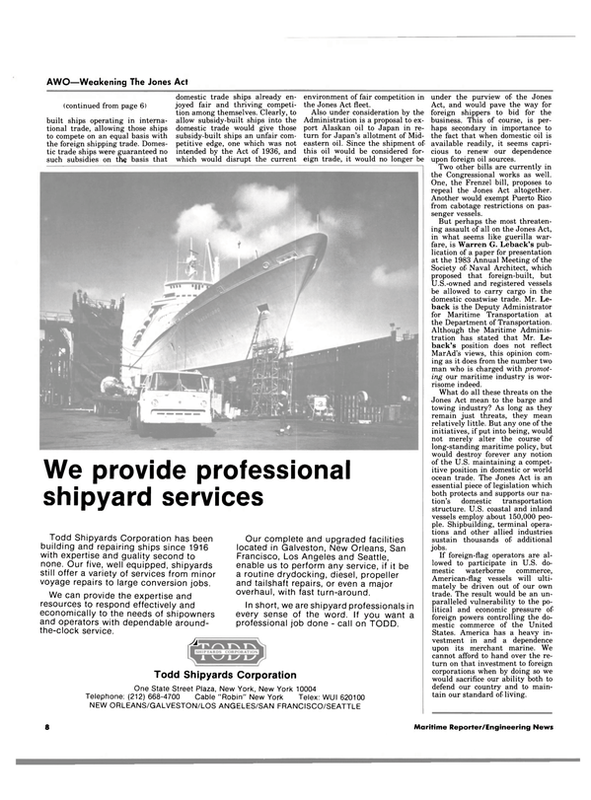 Henry M. Stupinski, a vetern of more than 25 years in the shipbuilding and repair industry, is general manager of the new Portland yard.